In the IAAF World Championships, the Olympic Games, and a host of other international, national, and local track and field meets, women compete in a wide variety of events, including middle- and long-distance races, like the 1500-meter, 10,000-meter, and the marathon. However, the inclusion of women in these races has a long history of exclusion. Many people already know the story of women’s fight for acceptance into the marathon—from Bobbi Gibb unofficially racing, wearing a swimsuit and nurse’s shoes, to Kathrine Switzer registering in 1967 using only her initials, to the USA’s Joan Benoit capturing the Olympic gold medal in 1984. These fights for entrance into the marathon represent key moments in women’s attempts at equality in sport. However, earlier struggles for inclusion must also be included in the history of women’s struggles for participation. One such event, the women’s 800-meter race in the 1928 Olympics in Amsterdam—the first ever time women competed in Olympic track and field—led to the exclusion of women from the race (and any Olympic competition longer than 200 meters) for the next 32 years. Part of the reason for the controversy surrounding this 800-meter race stemmed from the perception that nearly all the women collapsed upon finishing the race. In this post, I will explore why one short race led to decades of women’s exclusion. Hitomi Kinue (left) and Lina Radke (right) run the 800 meter race. Courtesy of Wikimedia Commons. The fateful race began on August 2, 1928, with nine women at the starting line. Each of the nine women finished the race with six runners breaking the previous world record. Lina Radke of Germany won the gold medal, completing the race in 2 minutes, 16 and 4/5 seconds, fully seven seconds faster than the previous world record, which Radke also held. Hitomi Kinue of Japan placed second followed by Sweden’s K. Gentzel in third. Other world record breakers included Canada’s Jean Thompson and Fanny Rosenfeld, finishing fourth and fifth respectively, and American runner Florence MacDonald who finished sixth. Chicago Tribune, August 3, 1928. The fact that Germany’s Radke won the race in world record breaking time, as did the other five top finishers, did not play a role in the media’s diagnosis of the problem. These performances, which outmatched all previous records, couldn’t, at least for the media, explain the understandable exhaustion after running the half mile. According to the press, the only viable reason for world-record breaking women to exhibit visible exhaustion was innate female frailty. Surely it couldn’t have been the fact that they had run faster than any before them. All these competitors had shown, at least in the eyes of the (male-dominated) media was that they were too weak to complete two laps around the track. In 1923, the international governing body of track and field, the IAAF, followed the request of the IOC and took steps toward regulating women’s track and field—quelling the power of the FSFI. Their early attempts to control the sport included denying the admission of women’s track and field in the 1924 Olympic Games. Eventually, the IAAF and FSFI came to a bargain. The FSFI agreed to follow the general rules of the IAAF and the IAAF agreed to consider a proposal for a full program of track and field events for women in the 1928 Games. Though the IAAF Congress voted against a full program of eleven events, they allowed women to participate in five track and field events in Amsterdam. This led to the inclusion of the most controversial event in the women’s track and field competition—the 800-meter race. After the race, the IOC and IAAF shared the press’s sentiments, indicating a level of discomfort many people, particularly men, had with women’s newfound role in Olympic track and field. Only days after the controversial race, and despite the falsity of the reports (shown by video and photographic evidence), the IAAF voted to eliminate the 800-meter run from future Olympic Games. The Los Angeles Times reported that the IAAF congress engaged in a “long, hot debate” concerning the banishment of the race, ultimately leading to its elimination. The 800-meter would not return to the Olympic program until 1960. IOC and IAAF members cited scientific reasoning for eliminating the 800-meter from women’s competition, going as far as to say that the 800-meter was too hard for women, and should be erased from the Olympic program. Their decisions—relying on mythology about women’s weaknesses, partly fit within the women’s sporting narrative of the time. Historians Patricia Vertinksy and Martha Verbrugge detail this mythology and the treatment of women in physical activity in the 19th century. They highlight the belief system, where women were seen as frail and physically incapable, that kept women from participating in vigorous exercise and competitive sport. These attitudes toward women’s bodies and abilities persisted into the early 20th century, affecting what types of competitions women could enter and how they were viewed in these athletic events. Gertrude Ederle swimming the English. Courtesy of Wikimedia Commons. The type of sports that women participated in also played a role in their acceptability. For instance, long distance swimmers, like Gertrude Ederle, the first woman to swim the English Channel (who swam the distance faster than all the men before her), was praised by the media. Reporters didn’t mention that Ederle might be too weak to make the swim or that she would suffer extreme exhaustion after 14 ½ hours in the water. Instead, they noticed that she appeared fresh, unhurried, and free from exhaustion, even after completing the arduous task. Sport historian Mark Dyreson gives some insight into the mindset of these reporters. During the 1920s, although women began to increase their participation in sport, oftentimes the press portrayed famous women athletes as “objects of desire.” Despite the fact that these women displayed a newfound freedom, the press continued focus on appearance rather than accomplishment. Therefore, sports deemed appropriate for women consisted of activities where women could remain beautiful—in male eyes—while competing. Even though Ederle’s swim across the Channel lasted 14 ½ hours while the 800-meter race lasted barely more than two minutes, the media still praised the swim while disparaging the run. Because they accepted swimming as appropriate for women, the press could report Ederle’s accomplishment without criticizing the endurance event. She remained beautiful—at least the press portrayed her that way—after swimming the Channel while they described unappealing exhaustion in the women breaking world records in the 800-meters in a grueling race. By emphasizing the importance of beauty, the media could deem the women’s 800-meter race unfit for women while commending Gertrude Ederle’s English Channel swim. Explanations of the quick elimination of the women’s 800-meter race point to many of the usual suspects. Olympic officials preferred to rely on shaky medical proof concerning women’s health to keep them from participating. The media focused on the athlete’s appearances, especially their exhaustion, rather than their impressive performances. All parties continued to believe (or at least promote) mythology about women’s frailty. Combined, these factors led to a multi-decade drought in women’s middle and long distance running. Two laps had the power to slow track and field’s movement toward equality and the acceptance of women in endurance running for the next 32 years. Colleen English is an Assistant Professor of Kinesiology at Penn State Berks. Her research focuses primarily on issues surrounding gender in sport. She can be reached on Twitter @colleen_english or by email at cue113@psu.edu. Alan J. Gould, “U.S. Gets Two Places During Competition,” Atlanta Constitution, August 3, 1928, Sports Section, pp. 14. 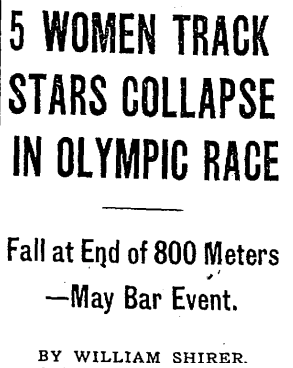 William Shirer, “5 Women Track Stars Collapse in Olympic Race,” Chicago Tribune, August 3, 1928, Sports Section, pp. 21. Knute Rockne, “Yankees Have Another Dull Day in Olympics,” Pittsburgh Press, August 3, 1928, Sports Section, pp 21. Wythe Williams, “Americans Beaten in 4 Olympic Tests,” New York Times, August 3, 1928, Sports Section, pp 32. “The Olympic Games,” The Times, August 3, 1928, Sports Section, pp. 6. Lou F. Marsh, “Jean Thompson Loses But Beats World Mark with Fanny Rosenfeld,” Toronto Star, August 3, 1928, News Section, pp. 1. “Amsterdam Like a Gigantic Circus, Including Clowns,” Montreal Daily Star, August 3, 1928, News Section, pp. 1. Carly Adams, “Fighting For Acceptance: Sigfrid Edstrom and Avery Brundage: Their Efforts to Shape and Control Women’s Participation in the Olympic Games,” In The Global Nexus Engaged, Sixth International Symposium for Olympic Research (London, Ontario: International Centre for Olympic Studies, 2002): 144-145. “World Saved for Feminism as Federation Decides to Retain Women’s Olympics,” Los Angeles Times, August 8, 1928, Sports Section, pp. 10. Mark Dyreson, “Icons of Liberty or Objects of Desire? American Women Olympians and the Politics of Consumption,” Journal of Contemporary History, 2003, pp. 435-460. I enjoyed reading your blog. I am currently taking a history course on sport history in the making of America. We have talked about the lack of involvement of women in early sport history but not in the Olympics. I never knew that this event happened in Olympic sports history. I found it interesting that this one race effected women’s movement to equality in the Olympic world for 32 years. I don’t understand how this one inaccurate description of a race can create such a devastating blow, when there was plenty of evidence that proved it was false. Even though women’s athletics has grown very quickly in recent history and proved previous accounts of women being too weak and frail to be wrong, how much further advanced and developed do you think women’s athletic would be today if this event never occurred? This is a compelling article about women’s fight for acceptance into the world of athletics. As a woman athlete myself, I find it disgraceful how false word of the press can be as powerful as to take away an individual’s participatory rights, even in the 19th century. It surprises me how Olympic officials and the media took every chance they got to deny women the opportunity to prove themselves as capable athletes mainly because they supported the image that women should remain controlled and beautiful for men. Furthermore, I learned from the textbook Major Problems in American Sport History by Steven A. Riess that it was not until 1859 that women started showing an interest in fun, sport-related activities. It did not occur to me until now that it took this long for them to become active societal members simply because they were denied their freedom to act anything but insecure, dainty, and weak. Do you believe that it could have been possible that parties were so quick to emphasize women’s frailty because they were afraid of more instances occurring like Gertrude Ederle’s and how she was the first woman to swim the English Channel faster than all the men before her? It would be a challenge against dominance, correct? This is a great blog that shows how Women persevered through the mid 1900’s in the athletic news, gossip, and world events. I am currently taking a Sport History Class at the University of Wyoming and found it so interesting that this event was publicized all over the world. The even bigger shock was that this race was publicized as a “tragedy” rather than a “Accomplishment.” I was sad to read that all the articles, newspapers, and interviews about this race were negative and showing that women are weak and “unfit” to run these types of races. Reading this blog now is so interesting because in today’s society we have women who compete in all different types of sports. Another interesting fact in your blog is that this race effected women for 32 years. It is so inspiring to know that women stayed confident and did not let one race/ news articles ruin their motivation to compete in the Olympics. I am proud to say that I have personally run many 800 meter races, and do know how it feels to have complete exhaustion after a race. This exhaustion does not mean that a women or a person is weak or incapable, it simply means they put every effort of emotion, strength, and mental will to push themselves as hard as they can. I believe all of these women are champions for competing, and beating the previous world record. This is an awesome post and even better to read knowing that women have and will always have a record in The Olympics.